This allows a broad variety of plants to survive the arid, sunbaked, windswept conditions of a roof, and provide nectar for insects and bees from February until October. (This is very different to a thin layer of sedum on a lightweight roof). 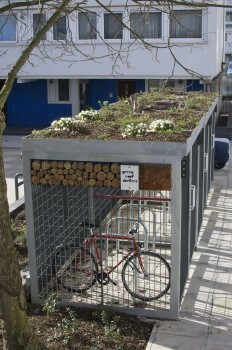 Below, our enclosed green roof cycle parking.